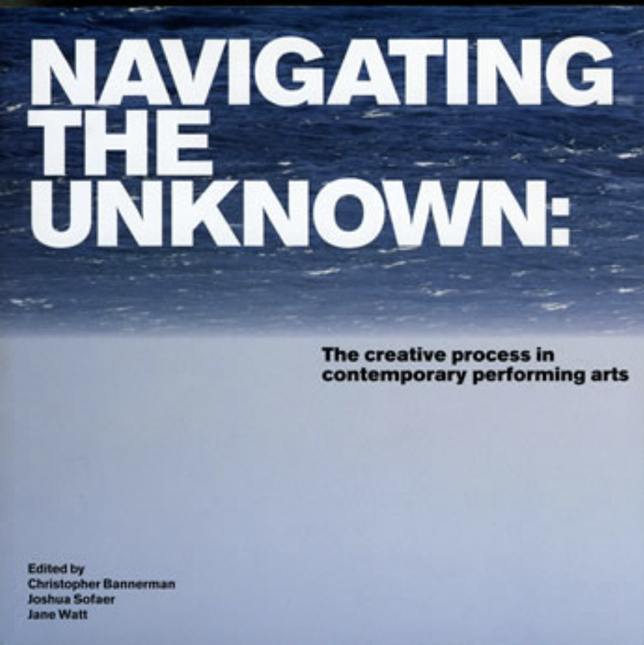 Navigating the Unknown: The creative process in contemporary performing arts eds. Christopher Bannerman, Joshua Sofaer & Jane Watt (London: MU Press, 2006). I am a contributor to, and co-editor of, this publication. Over the course of fifteen chapters artists’ creative processes are examined, together with the implications that these processes have in the wider world. This book brings together academic research and the actual experience of professional artists through the artist’s own voice. Based on a five-year research programme supported by NESTA (National Endowment of Science, Technology and the Arts) the book draws on knowledge from internationally renowned performance makers in the fields of dance, performance, live art and music together with outside experts in the fields of philosophy, literature and learning sciences. My chapter ‘All Aboard’ questions the idea of linear progression in making an artwork. It presents notions of the artist’s practice in relation to her creative journey and examines the importance of arriving at a finished product. The work and writings of composer, musician and artist Graeme Miller and choreographer Shobana Jeyasingh are referenced as evidence of specific artistic practice, in addition to Jason Wilson’s writing on travel writing.